Erica Dicker works in a wide variety of musical settings, bridging the realms of notated and improvised music. Taking Auspices, her “knockout solo debut,” [Bandcamp Daily, April 2018] reflects her interest in experiencing eidetic memories as aural phenomena, a sensibility she brings to her collaborative work. A dedicated proponent of new music, Erica is a founding member of the contemporary chamber music collective Till By Turning as well as Vaster Than Empires, an electro-acoustic ensemble with composer and sound artist Paul Schuette and percussionist Allen Otte. As part of the New York-based horn trio, Kylwyria, Erica and her colleagues Julia Den Boer and John Gattis work to generate interest in and commissioning adventurous chamber music repertoire for their unique instrumentation. Always eager to collaborate, Erica has worked closely with composers such as Olivia Block, Turkar Gasimzada, Ryan Ingebritsen, and Katherine Young in developing experimental repertoire for solo violin. Erica regularly lends her talents to the Grand Rapids Symphony and serves as concertmaster for the Tri-Centric Orchestra, an ensemble founded to premiere and record the operas of Anthony Braxton. 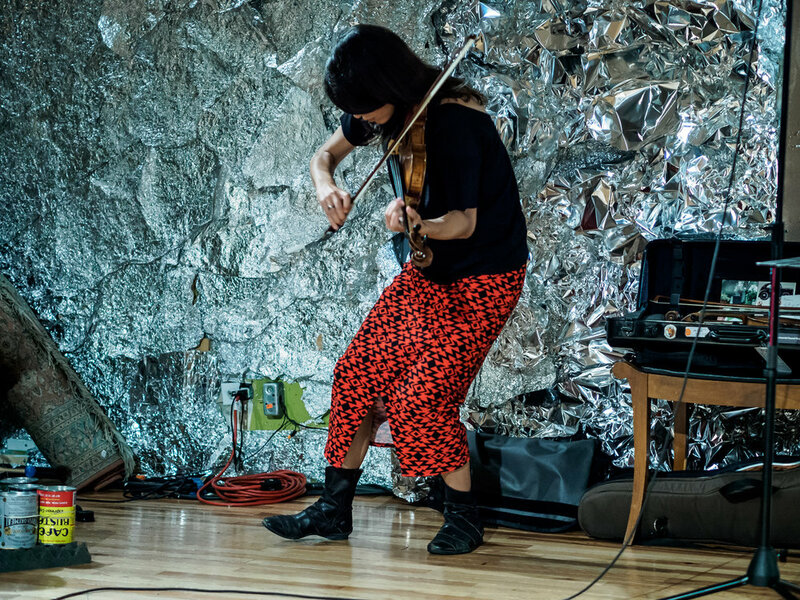 She has performed alongside Braxton in his Falling River Quartet and Diamond Curtain Wall Quartet at festivals in Belgium, Germany, Italy, Macedonia, Poland, and Turkey and appeared with the 12+1-tet at the 2012 Venice Biennale. Engaging others in Braxton’s music also inspires Erica as an educator. She has written about and curated performances of his work, most recently for the International Contemporary Ensemble at the 2017 Ojai Music Festival, and leads workshops on free improvisation and creative musicianship. Erica attributes a significant part of her music education to the Illinois Wesleyan University college radio station 88.1 WESN (Radio to the Far Left) FM which still broadcasts in her hometown of Bloomington-Normal, Illinois. She holds degrees from the Oberlin Conservatory of Music, the University of Minnesota, and the Cincinnati College Conservatory of Music. Her primary teachers include Marilyn McDonald, Jorja Fleezanis, and Gabriel Pegis.